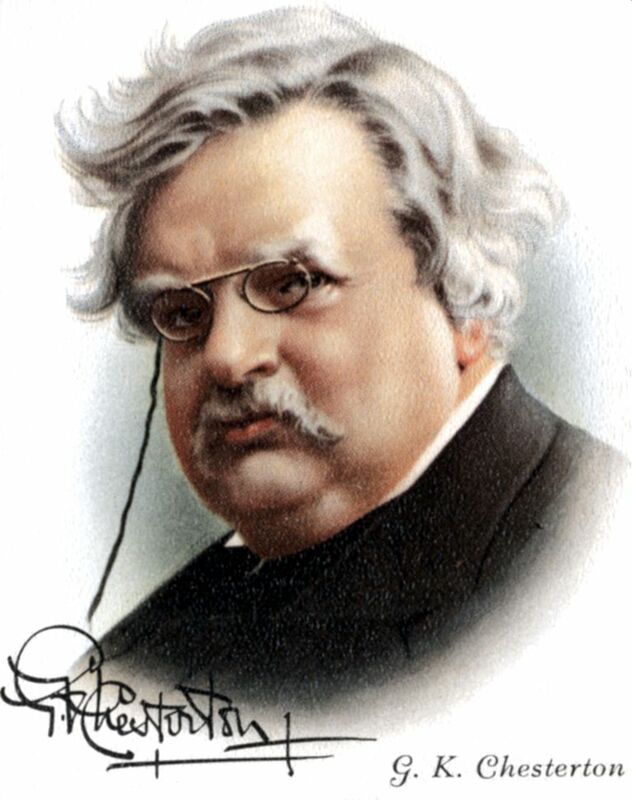 One of the most prolific British authors of the early 20th century, G.K. Chesterton is best known today for his novel "The Man Who Was Thursday" (1908) and his 51 short stories featuring the amateur detective Father Brown. In addition, he was a master of the essay -- called the only literary form that confesses, in its very name, that the rash act known as writing is really a leap in the dark. The word "essay" comes from the French word "essayer," meaning to try or attempt. In the preface to his essay collection "Tremendous Trifles" (1909), Chesterton encourages us to be "ocular athletes": "Let us exercise the eye until it learns to see the startling facts that run across the landscape as plain as a painted fence." In this "fleeting sketch" from that collection, Chesterton relies on two common items -- brown paper and a piece of chalk -- as starting points for some thought-provoking meditations. I remember one splendid morning, all blue and silver, in the summer holidays when I reluctantly tore myself away from the task of doing nothing in particular, and put on a hat of some sort and picked up a walking-stick, and put six very bright-colored chalks in my pocket. I then went into the kitchen (which, along with the rest of the house, belonged to a very square and sensible old woman in a Sussex village), and asked the owner and occupant of the kitchen if she had any brown paper. She had a great deal; in fact, she had too much; and she mistook the purpose and the rationale of the existence of brown paper. She seemed to have an idea that if a person wanted brown paper he must be wanting to tie up parcels; which was the last thing I wanted to do; indeed, it is a thing which I have found to be beyond my mental capacity. Hence she dwelt very much on the varying qualities of toughness and endurance in the material. I explained to her that I only wanted to draw pictures on it, and that I did not want them to endure in the least; and that from my point of view, therefore, it was a question, not of tough consistency, but of responsive surface, a thing comparatively irrelevant in a parcel. When she understood that I wanted to draw she offered to overwhelm me with note-paper. I then tried to explain the rather delicate logical shade, that I not only liked brown paper, but liked the quality of brownness in paper, just as I like the quality of brownness in October woods, or in beer. Brown paper represents the primal twilight of the first toil of creation, and with a bright-colored chalk or two you can pick out points of fire in it, sparks of gold, and blood-red, and sea-green, like the first fierce stars that sprang out of divine darkness. All this I said (in an off-hand way) to the old woman, and I put the brown paper in my pocket along with the chalks, and possibly other things. I suppose every one must have reflected how primeval and how poetical are the things that one carries in one's pocket; the pocket-knife, for instance, the type of all human tools, the infant of the sword. Once I planned to write a book of poems entirely about things in my pockets. But I found it would be too long, and the age of the great epics is past. I crossed one swell of living turf after another, looking for a place to sit down and draw. Do not, for heaven's sake, imagine I was going to sketch from Nature. I was going to draw devils and seraphim, and blind old gods that men worshipped before the dawn of right, and saints in robes of angry crimson, and seas of strange green, and all the sacred or monstrous symbols that look so well in bright colors on brown paper. They are much better worth drawing than Nature; also they are much easier to draw. When a cow came slouching by in the field next to me, a mere artist might have drawn it; but I always get wrong in the hind legs of quadrupeds. So I drew the soul of a cow; which I saw there plainly walking before me in the sunlight; and the soul was all purple and silver, and had seven horns and the mystery that belongs to all beasts. But though I could not with a crayon get the best out of the landscape, it does not follow that the landscape was not getting the best out of me. And this, I think, is the mistake that people make about the old poets who lived before Wordsworth, and were supposed not to care very much about Nature because they did not describe it much. They preferred writing about great men to writing about great hills, but they sat on the great hills to write it. The gave out much less about Nature, but they drank in, perhaps, much more. They painted the white robes of their holy virgins with the blinding snow, at which they had stared all day. ...The greenness of a thousand green leaves clustered into the live green figure of Robin Hood. The blueness of a score of forgotten skies became the blue robes of the Virgin. The inspiration went in like sunbeams and came out like Apollo. But as I sat scrawling these silly figures on the brown paper, it began to dawn on me, to my great disgust, that I had left one chalk, and that a most exquisite and essential chalk, behind. I searched all my pockets, but I could not find any white chalk. Now, those who are acquainted with all the philosophy (nay, religion) which is typified in the art of drawing on brown paper, know that white is positive and essential. I cannot avoid remarking here upon a moral significance. One of the wise and awful truths which this brown-paper art reveals, is this, that white is a color. It is not a mere absence of color; it is a shining and affirmative thing, as fierce as red, as definite as black. When, so to speak, your pencil grows red-hot, it draws roses; when it grows white-hot, it draws stars. And one of the two or three defiant verities of the best religious morality, of real Christianity, for example, is exactly this same thing; the chief assertion of religious morality is that white is a color. Virtue is not the absence of vices or the avoidance of moral dangers; virtue is a vivid and separate thing, like pain or a particular smell. Mercy does not mean not being cruel, or sparing people revenge or punishment; it means a plain and positive thing like the sun, which one has either seen or not seen. I sat on the hill in a sort of despair. There was no town near at which it was even remotely probable there would be such a thing as an artist's colorman. And yet, without any white, my absurd little pictures would be as pointless as the world would be if there were no good people in it. I stared stupidly round, racking my brain for expedients. Then I suddenly stood up and roared with laughter, again and again, so that the cows stared at me and called a committee. Imagine a man in the Sahara regretting that he had no sand for his hour-glass. Imagine a gentleman in mid-ocean wishing that he had brought some salt water with him for his chemical experiments. I was sitting on an immense warehouse of white chalk. The landscape was made entirely of white chalk. White chalk was piled more miles until it met the sky. I stooped and broke a piece of the rock I sat on: it did not mark so well as the shop chalks do, but it gave the effect. And I stood there in a trance of pleasure, realizing that this Southern England is not only a grand peninsula, and a tradition and a civilization; it is something even more admirable. It is a piece of chalk.